The Bengal Cat originated from a mix of breeds such as the Abyssinian, American Shorthair, Burmese, Egyptian Mau and the Asian Leopard Cat. During the 1960s, researchers, such as California's Jean Mills, were studying cat-related diseases such as leukaemia and other cancers. While engaged in this research it was discovered that wild cats such as the lion and tiger were immune to some of these diseases. And so the wild Asian Leopard Cat was bred to the common house cat in a bid to study how its immune system would cope with these diseases. Then Mrs Mills, in 1963, crossed a female Asian Leopard Cat and a black male domestic cat - the resulting litter was filled with a mix of solid and spotted kittens. One of the spotted female kittens was then mated back to the father and the resulting litter had spotted kittens. 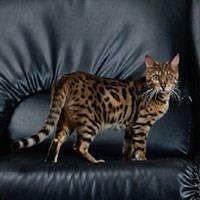 This was the beginning of the Bengal Cat. The Bengal Cat is a unique breed of cat in that it is the only spotted breed that is directly descended from a large wild cat - the superb Asian Leopard Cat and the goal in producing the Bengal was to recreate the look of its wild ancestor, but in a domestic cat. The Bengal today, is truly a special breed that carries much intrigue and delight to everyone who is fortunate enough to meet them. Their beautiful colours and patterns certainly do place them in the unique breed category. This delightful cat is also suited to most people and their situation, but they must remember Bengal cats are boisterous, energetic and very playful and they also want to be the boss, so to care for them properly they do need someone that can handle them! They are extremely intelligent and can be quite easily taught basic commands, can be walked on a lead and they will come when called by their owner - and similar to all cats they are "telepathic".If you want a friendly and loving cat and one that is blessed with a unique beginning you cannot go past this glorious animal.